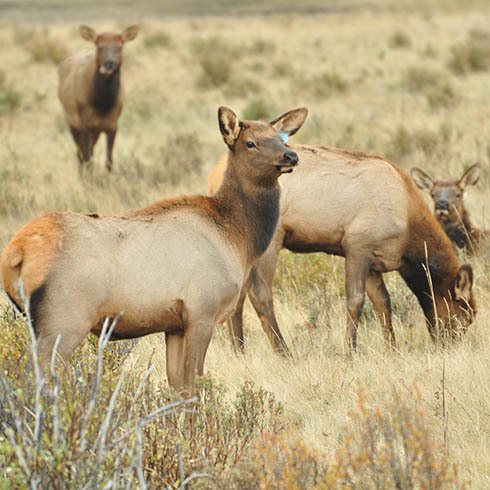 Since 2000, researchers at the University of Alberta and University of Montana have worked collaboratively to investigate how changes in the Ya Ha Tinda elk population are affected by humans (harvest, habitat management), natural factors (predation, climate) and natural vegetation dynamics. We work to understand the changing migratory behavior of elk and the trophic dynamics within this predator-prey-montane grassland system and also a long-term perspective on grassland dynamics. Combined, our studies of the population at Ya Ha Tinda represent one of the longest elk population studies in a system with intact natural predators, including wolves and grizzly bears and human hunting. On January 21, Dr. Jodi Berg successfully defended her PhD thesis entitled “Shifts in strategy: Calving and calf survival in a partially migratory elk population”. Mark Hebblewhite is recruiting a new PhD student for Fall 2019 to work on the Ya Ha Tinda long-term elk project. Find out more here (.pdf). September 2018: A Wildlife Society Bulletin paper was published from our long-term research on identifying large carnivores from hair samples. Supported in part by our long-term NSF funding at Ya Ha Tinda, Matt Metz and Mark Hebblewhite published a paper on the role of wolf predation in shaping the evolution of the timing of elk antler shedding in Yellowstone National Park. Our first hunting season during our bull elk research component is underway. Thanks to all hunters for passing along information about the your harvested bull to Hans Martin.